5 OTB Gifts for Your Father Who’s Turning 50 This Year! What do you get the man who means the world to you? Wouldn’t you want to make your father’s 50th birthday special? Classic gifts like cufflinks, ties, wallets, shirts are outdated, you should now move to some personalised and modern gifts like gadgets, wine etc. While there are hundreds of gifting options available in the market, we bring to you the 5 out-of-the-box gift options for your father that he is sure to like. But at the end of the day, make sure that you select the final gift according to the preference of the birthday boy. At 50, your dad will appreciate nothing less than a fine, vintage bottle of wine. With luck, they’ll age as the wine and uncork it with a celebration on their mind. You can also get it customized with labeled wishes and celebrate their half-century with a fine glass of wine. Though it’s hard to find a vintage wine which suits your budget, but it’s completely worth the effort. Let your father kick in the next half-century in style. What better gift for fathers than an annual amazon prime subscription? There are so many good things your father can do with it- things that didn’t exist 50 years back. Free next day shipping, millions of songs, a great collection of Amazon original series and Hindi cinema, grocery shopping at the comfort of your home. Who wouldn’t like that? Is your father a fitness enthusiast? Trust us, this gadget will meet your father’s secret delight and might make him a fitness addict to get his 10,000 steps done by the closing of the week. This gadget will sure be a blessing in disguise. Is there any better gift for fathers than their very own box of creativity? A 3D Printer is one of the best ideal gift options for your father who has a creative edge and loves to tamper in the garage, build sculptures, paint large canvases or play around electronics. Gift them a 3D printer and give wings to their creativity. How about you gift him nostalgia? If your father is a fan of classical music, you can give him Saregama Carvaan to feed his retro craving. This music player has a solid collection of 5000 evergreen Hindi songs by legendary singers like Kishore Kumar, R.D.Burman, Mohd. Rafi, Lata Mangeshkar, Jagjit Singh. Gift him this throwback piece to make him relive his long lost memories. 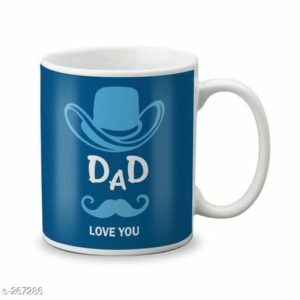 It is one of the cool gifts for your father, you can also gift this to your father on father’s day. If your father is still a child at heart, giant yard games can be a perfect gift. As he has already completed 50 years, his eyesight might have started to go a bit hazy, giant yard games can serve him just right. They are fun to play plus look great as a garden-landscape design. It’s a fun way to keep your father fit and active.